Neuro-Art. 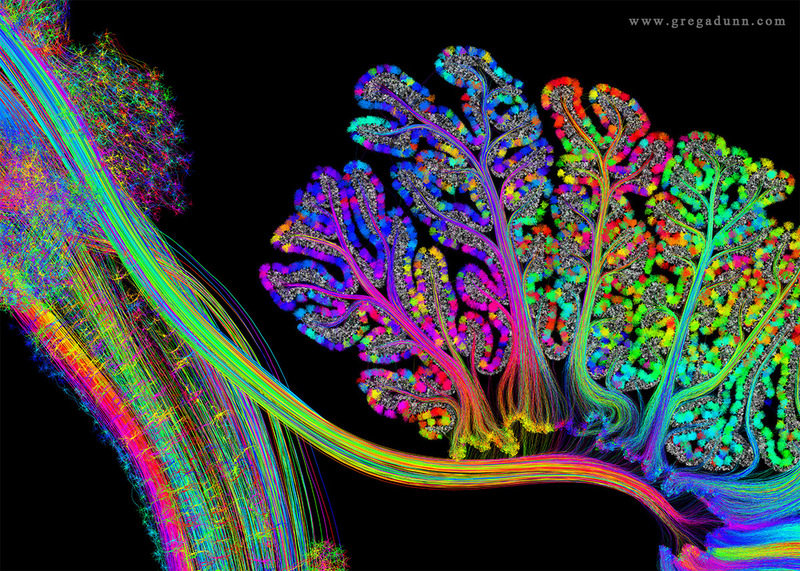 The Beauty of the Human Brain. We want to change the consciousness of the public and how they think of the brain. Philadelphia, PA based neuroscientist, Dr. Greg Dunn, has taken his studies of the brain to the next level. 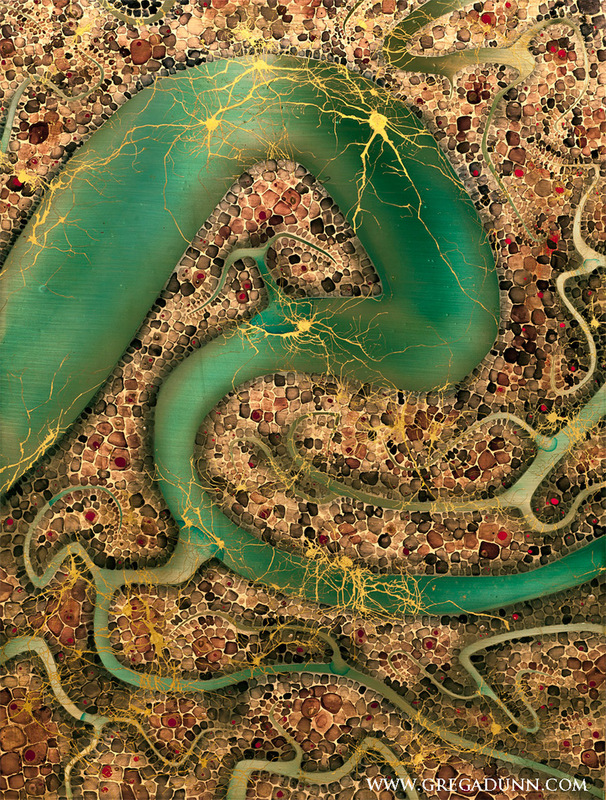 He brings scientific images of neurons and larger portions of the brain to life in dazzling artwork. This has culminated into the new artistic breakthrough of reflective microetching, created by Dr. Dunn and his colleague, Dr. Brian Edwards, which creates 3D animated imagery so that viewers can truly understand the science, beauty, and stunning complexity of the brain. 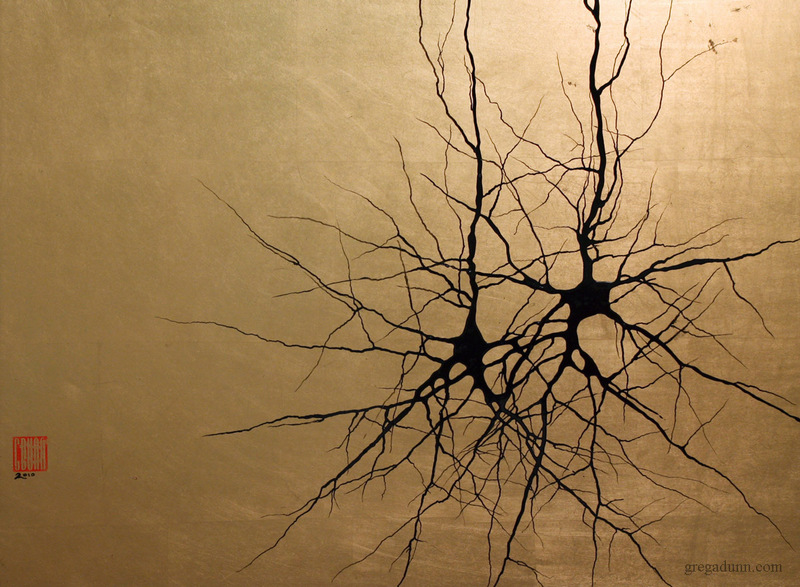 You are a neuroscientist and a visual artist. How in the world does your left and right brain work so well together? Some would say science and art are two separate entities. Society has crammed specific definitions as to what art and science are and how they are distinct which leads the average person to conclude that they are very separate entities. There are many artists who are using scientific principles in their work and many scientists who are using artistic ones. In my mind, the principal distinction between an artistic and a scientific pursuit is that science seeks to uncover principles and ideas that already exist in objective reality, and art seeks to bring subjective ideas into objective reality. By this definition, photorealistic painters are more scientists than artists as they are describing external, objective reality, and the results of their artistic experiments are the same- a verbatim description of objective reality. Furthermore, the whole movement of Impressionism is science art. The genius founders of this movement experimented, figuring out how to hack your brain to give you an enriched experience given from a sparse visual stimulus. These artists like Van Gogh, Monet, and Seurat are giving the viewer impressions that allow the viewer to fill in details from their individual experiences. In contrast, a scientist that takes their knowledge of their field and processes it through their own creative ideas, fusing their knowledge across disciplines and coming up with new hypotheses is bringing their own ideas about how nature works into objective reality. The scientist in this case is functioning in some degree as an artist. In general, everything both artists and scientists do is somewhere on the spectrum between science and art. 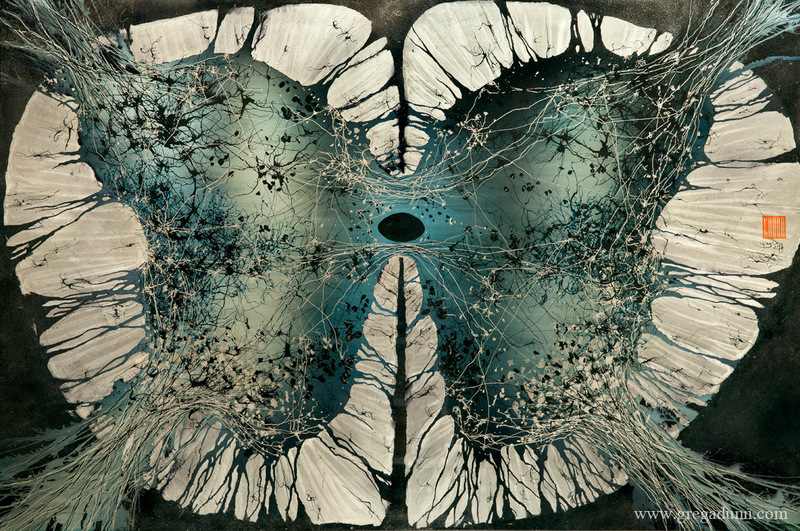 How did your training and work as a neuroscientist develop into your work as a visual artist? I studied neuroscience because I am one of these people who has a hard time figuring out what to do with his or her life because I’m interested in so many things. Luckily, I came across neuroscience. The brain is the most fundamental thing that makes us human and it is also responsible for providing us with the ability to be curious in the first place. It is what differentiates us from other organisms and each other, but it is also what all of humanity has in common. Everything we do is connected to the brain. The most important thing I learned in graduate school is that the brain is unbelievably elegant and complex. The brain is our unimaginably sophisticated device that allows us to navigate the world and our experiences. 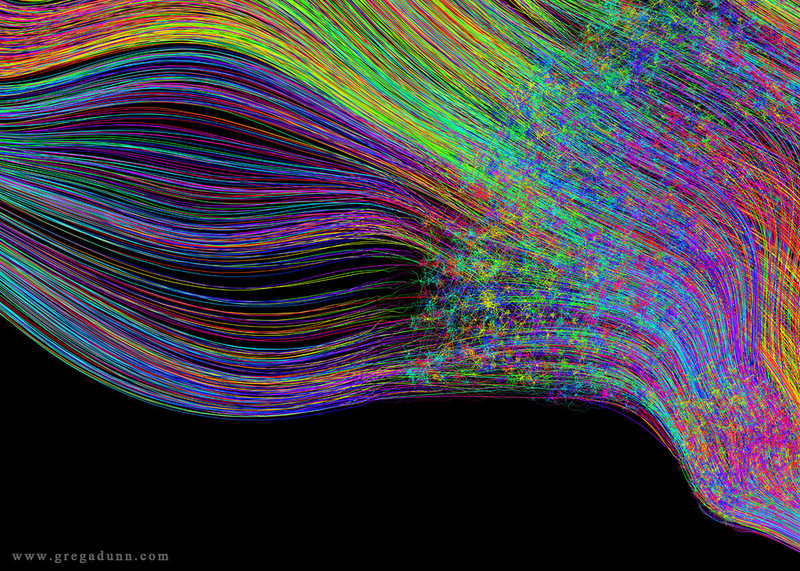 Even a single neuron is complex, let alone the network of 80 billion neurons that compose the brain. It is a very easy thing to take this precious gift for granted, myself included, and I am dedicating a large part of my career to helping others better understand what most fundamentally makes them human. As I progressed through graduate school I realized that I would be of greater use in fusing art and science to reach the average person with these ideas rather than at doing research at the lab bench. I hope to recruit the emotional power of art to convey concepts that would otherwise be difficult to traditional forms of scientific communication to illustrate. Can you explain why the brain is made up of fractal shapes? Through eons of evolution, nature has encountered similar problems of design on different scales. For example, a tree is a branching structure that needs to collect light, and a neuron is a branching structure that needs to collect input from other neurons. Nature solved these two problems by using similar forms, called fractals. A fractal is a shape whose form is independent of scale. It ends up being an extraordinarily efficient method by which nature solves these problems. A few interesting studies have suggested that the brain connects through fractal like shapes, and there are a lot of good mathematical reasons for this that have to do with utilizing the available space for the greatest amount of complexity. That our brain is wired as a fractal may provide a fascinating and strange explanation as to why we find their shapes appealing. In some ways it might be a stimulus that is hardwired for efficient visual processing. You integrate Asian art styles into your work because the minimalism of Eastern art speaks to you? 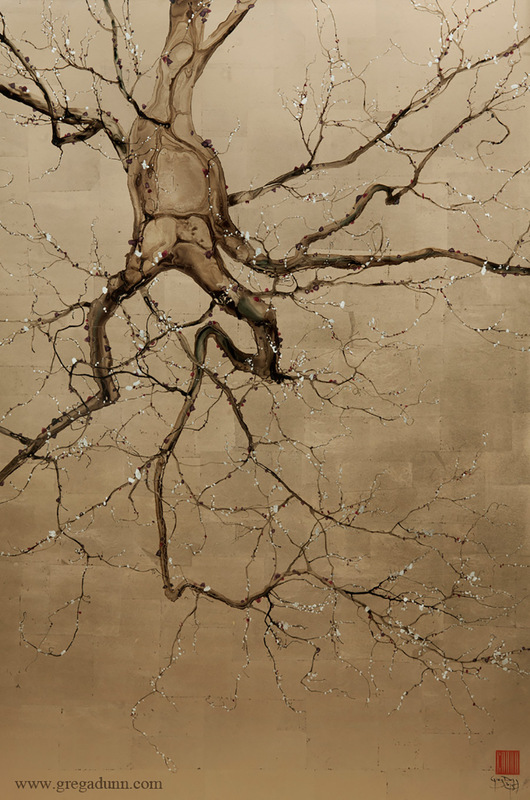 At first, combining Asian art and neuroscientific themes was an obvious choice for me. 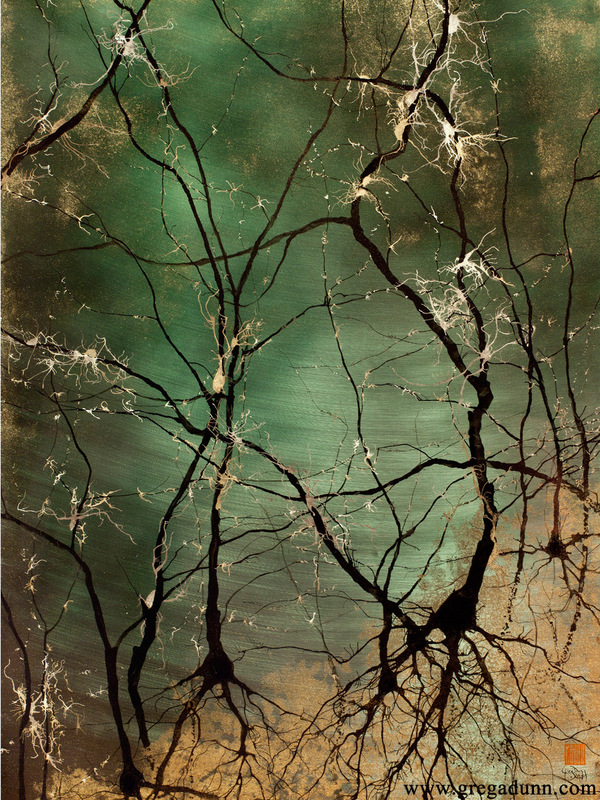 As neurons resemble many subjects that have been painted in this style for hundreds of years such as trees and branches, it made intuitive sense to me that combining these aesthetics would communicate this idea about fractal composition of the universe well. I was drawn to Asian art because there is space to breathe. The contrast between lots of detail and very little of it on the same canvas allows the viewer’s brain to appreciate form with added clarity. The negative space emphasized in Asian art gives built in contrast that adds clarity to a piece, particularly when the thrust of the piece is to emphasize form. The brain is essentially a contrast detector as it is maximally sensitive to even small changes in temperature, taste, sound, etc., so building in contrast to pieces of art makes good sense to me. Asian artists understand that a certain type of emotional reaction to minimalist art comes from the fact that brain is activated by contrast. They introspectively study how the mind works. They aren’t in a lab but they are putting out visual stimuli that they know people and they themselves react to. Instead of brush painting, you first create your images by blowing ink on paper. Why does this medium appeal to you? My ink blowing technique recruits nature to reveal fractal shapes like those that make up neurons. When painting by hand, the brain is terrible at replicating the randomness and spontaneity that nature easily achieves everywhere around us because our brains are meant to discover and generate patterns, not randomness. I discovered that by blowing ink, the turbulence in the air and the natural variations in the paper cause elongating lines to take on the character of what a neuron or tree looks like when it is actually growing. As you practice control is attained, but at its core this technique is governed by randomness. It is a way to bring abstract expressionism into the studio that gives the quality of line that I am after. You and your colleague, Dr. Brian Edwards, invented the process of reflective microetching, which you call an “artistic breakthrough”. How and why did your development of microetching come about? First off, I want to thank and discuss my collaborator, Dr. Brian Edwards, who has a PhD in Applied Physics and Electrical Engineering. I have learned an incredible amount from him. He is an every day kind of guy who happens to be a genius and without whom this work would have been impossible. Microetching was invented in order to break up extremely complex images into third dimensions of reflectivity by etching metallic surfaces on a microscopic scale. I had been trying to figure out a way to depict the brain in its actual complexity, not just at the resolution of a few neurons, and adding a third dimension seemed the most appropriate way to do this. Microetchings allow seemingly two dimensional, flat pieces of artwork to animate based on reflected light as the viewer walks around them. They also turn color into a very flexible variable as microetchings take on the character of their environment and can thus appear in as many ways as it is possible to light them. What is the basic principal of microetching? Microetching is the engineering of a metal surface to encode information into it to make images appear and disappear depending on the viewer’s point of view. Microetching is a very distant cousin of holography and the cousin of lenticular printing, though it divides etching space and scale differently than these methods. It stems from the basic idea that if a mirror like surface is scratched at specific angles that light reflecting off of the surface will head toward particular coordinates, a tendency that we can exploit to make very highly engineered surfaces that can elegantly unfold a complex artistic story. In your art you replicate the complicated science of the brain and its different regions, such as the cerebellum, the cerebral cortex, and the hypothalamus. 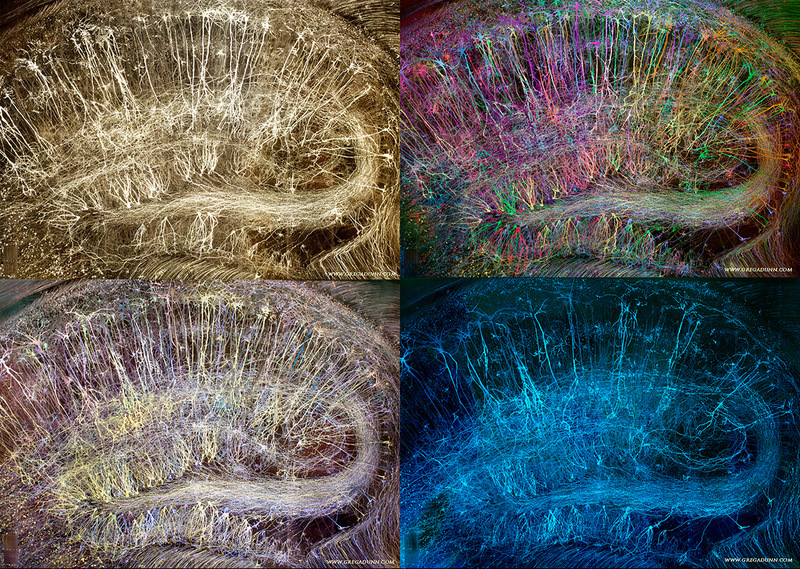 What do you find to be some of the most beautiful aspects of the brain? Aesthetics aside, some of most beautiful parts of the brain are its deep conceptual logic, the geometry of how things are connected and how information is processed. For example, take our olfactory system. The brain only has so much real estate inside of it because our heads are only so big. It needs to encode massive amounts of information in a relatively small space. Imagine now that you had one type of neuron that recognized only one smell. In this case, you would need thousands or millions of different types of neurons to discriminate between smells, and if a neuron was lost, you’d have lost your ability to perceive that smell. In reality, the brain has figured out this problem using a concept called population coding. Instead of millions of neurons each tuned to some different molecular shape that it “smells”, there are only a few hundred types of neurons, each category of which recognizes a broad molecular feature. It is the collective, analog activity of each of those hundreds of populations of neurons that can give rise to a gigantic number of unique olfactory perceptions based on their relative response to a smell. It is a vastly more efficient method to solve this problem, and it is beautiful in its simplicity. You and Dr. Edwards received a grant from the National Science Foundation for a new project that will be shown at the Franklin Museum in Philadelphia, PA this coming June 2016. The exhibit sounds not only incredibly interesting but also groundbreaking. Can you explain what the piece will be? The piece will be an 8×12 ft. reflective microetching of a slice of the human brain at as close to full complexity and resolution as possible. We estimate that there will be anywhere from a half a million to three quarters of a million neurons in it. The piece will be an incredibly elaborate portrait of humanity, emulating the anatomy and functionality of your brain as your own brain is looking at itself. As microetching allows us to animate images as the viewer moves around, we can animate the electrical neural impulses the brain uses to communicate through a massively complicated series of algorithms that recreate how neurons work. We are essentially building a visual model of the brain using algorithms used to calculate connectivity and then etching this into final microetching form. 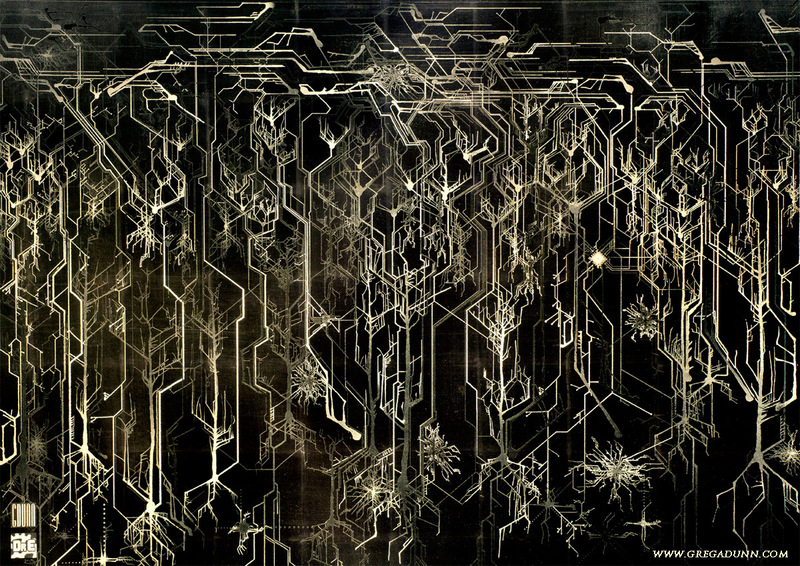 The piece will be made using a combination of organic painting techniques, digital assembly, algorithm manipulation, collation of datasets, deep neuroscience research, and strategic lighting design. At its core, what this piece is actually about is allowing each person to look at it and to understand themselves better. I would like viewers to recognize our common humanity. This piece will provide a huge amount of detailed information designed to give a visceral response to the artwork to both professional neuroscientists and the lay public alike. What do you hope your artwork inspires in people? We want to change the consciousness of the public and how they think of the brain. This piece is for everyone’s benefit. For kids, adults, artists, scientists, people who are struggling with mental illness, addiction, Alzheimer’s, etc. This piece will provide a detailed map of the brain that will hopefully contribute to a better-informed public whose basic science knowledge is increasingly necessary to make informed decisions about their health and well-being. I hope to have the viewers of this piece take a step backward and to remember, if for only a moment, that our lives are a miracle governed by the most complex object in the known universe. 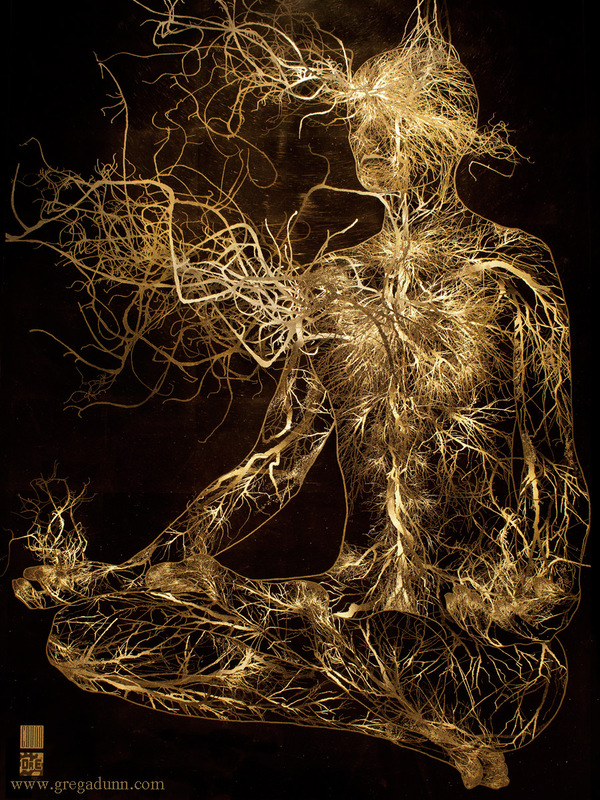 Greg Dunn is an artist who received his PhD in neuroscience from the University of Pennsylvania in 2011. 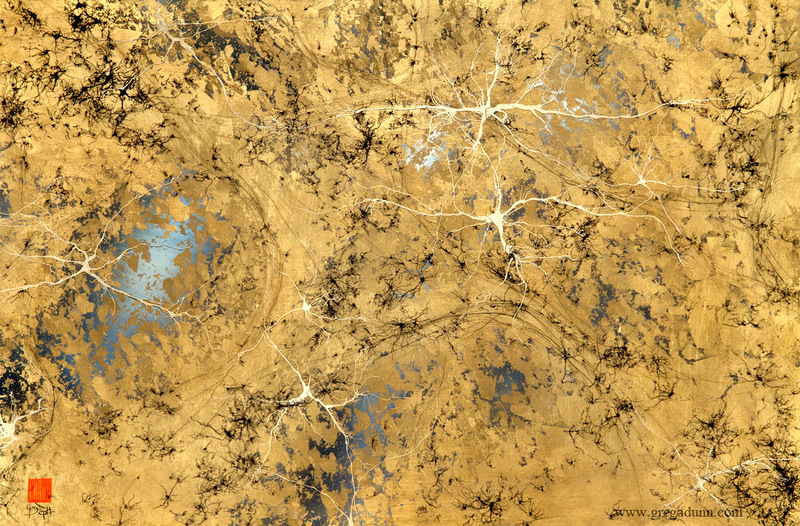 While a graduate student, Dunn’s artistic experiments demonstrated that the qualities of neural forms fit seamlessly into the aesthetic principles of minimalist Asian art and sumi-e scroll and gold leaf painting. Dunn is now a full time artist out of Philadelphia where he works to incorporate his knowledge of neuroscience, physics, and biology into the artistic process through both imagery and technique. Together with Dr. Brian Edwards, a collaborating artist and electrical engineer at Penn, Greg invented a revolutionary technique called reflective microetching that allows dynamic control of imagery and color in reflective gold surfaces. 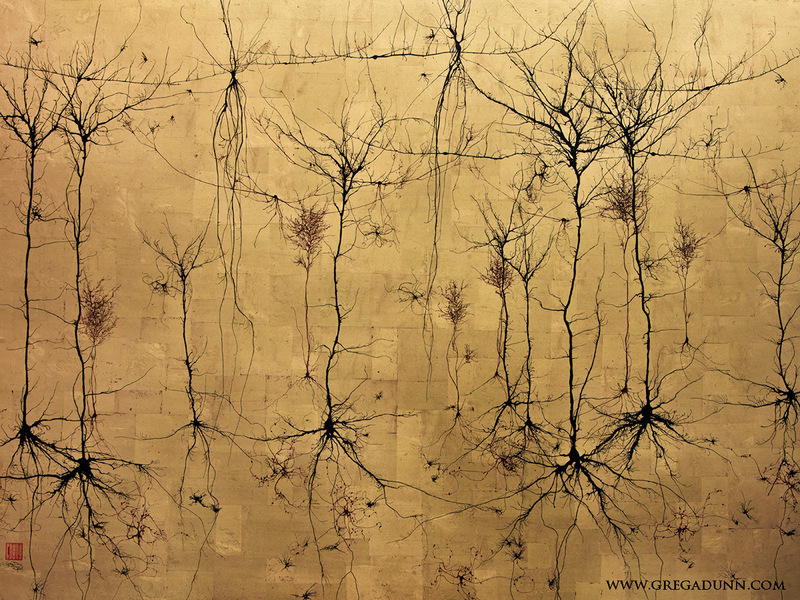 This work has led to the awarding of a grant from the National Science Foundation to produce an enormous 8’ X 12’ microetching of the human brain, the most complex and detailed artistic piece on the brain that will exist in the world. Dunn and Edwards are currently working on this massive project with the help of neuroscience and fine art students that is expected to be completed and permanently hanging in the Franklin Institute in Philadelphia in Spring of 2016.